Below a description about growing tomatoes. 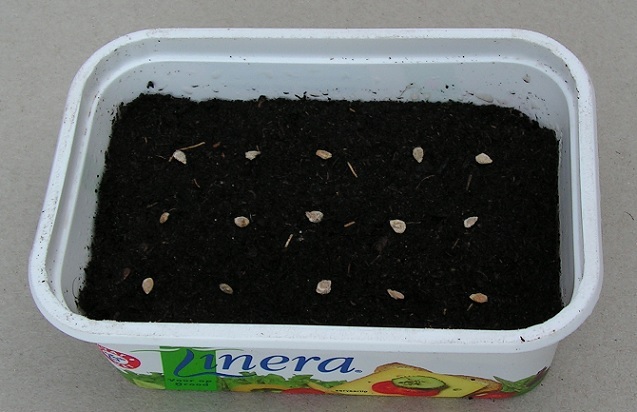 Tomatoes are sown indoors in early spring (March or April). But you can start with a few plants in late winter (February) to have early tomatoes. I have good results when using the tomato species “Moneymaker”. Raising plants from seeds goes well. The plant produces many big healty fruits as shown on the photos above. In a closed, seperate garden, many good tomatoes grow on plants in the open air during a good (warm dry) summer. At longlasted or much rain, some tomatoes get cracks. When you break off the leaves with brown spots, there is less risk of rotting fruits due to the plant disease Phytophthora. I harvested many good tomatoes in my backyard garden at self raised Moneymaker plants, just in the open air. Two neighbours in our street had bought tomato plants (of another species) and had planted them in their backyard gardens, in the open air. Their tomato plants had many brown leaves and rotting fruits. So you better grow your own plants from seed (of a known good species) than buy plants without knowing the species and the sensitivity of Phytophthora (Tomato Blight). 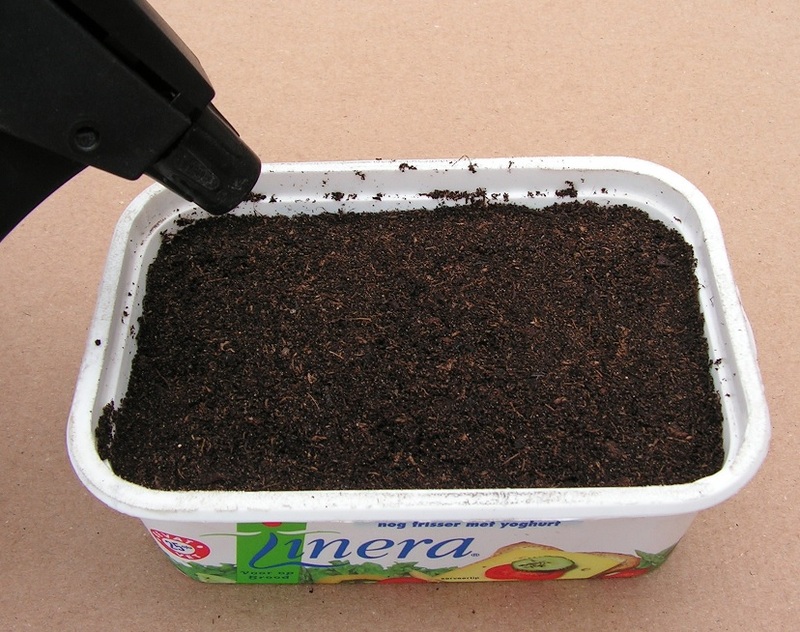 You can sow tomatoes in a small (250 grams) plastic margarine box filled with sieved moist potting soil. Sieving potting soil goes well through the bottom holes of a plastic flower pot. 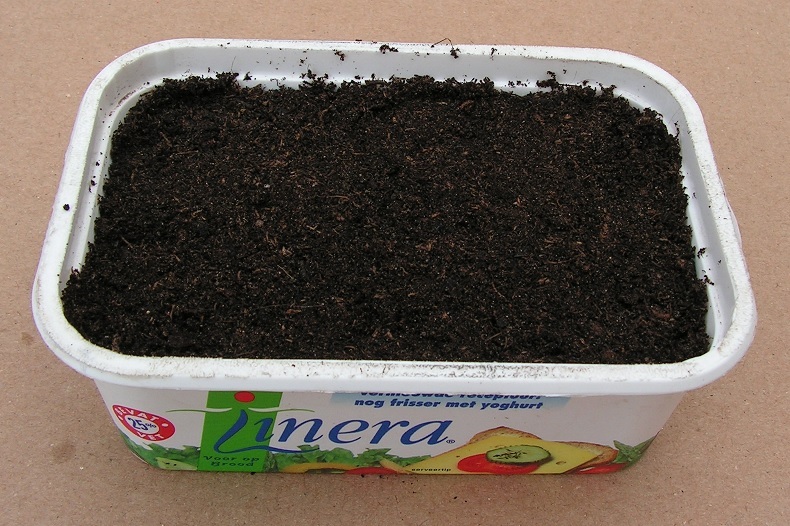 Fill a small (250 grams) margarine box with potting soil. Flatten the top of the soil. 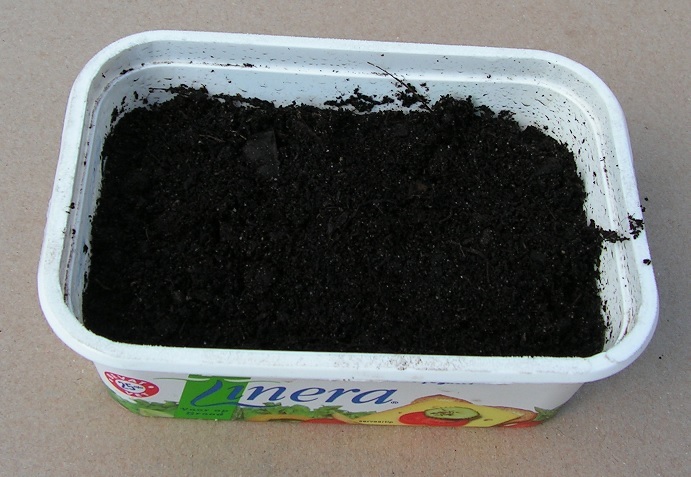 Use the bottom of another margarine box to press on the potting soil. Spray cold water on the potting soil. Lay tomato seeds on the potting soil. 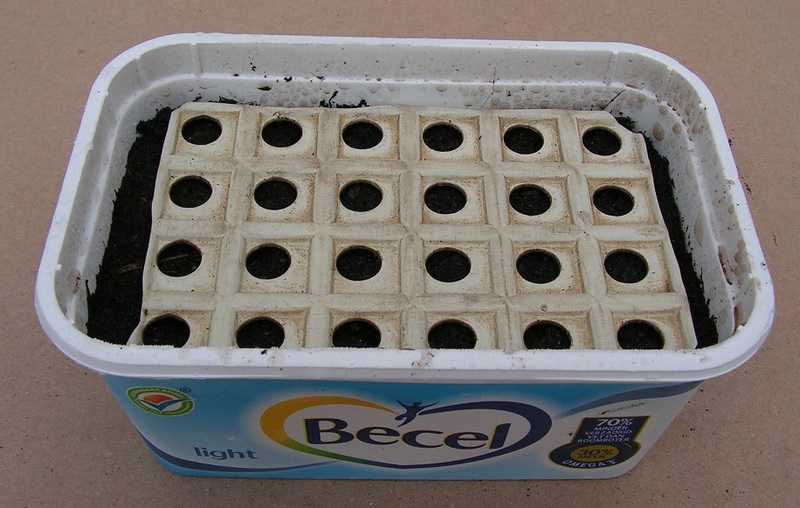 Put (lay) a well fitting lid loose on the box with sowing soil. Or click on at one side. This forms narrow air openings and the potting soil does not dry out fast. The seeds feel fresh air, but the potting soil does not dry out fast. 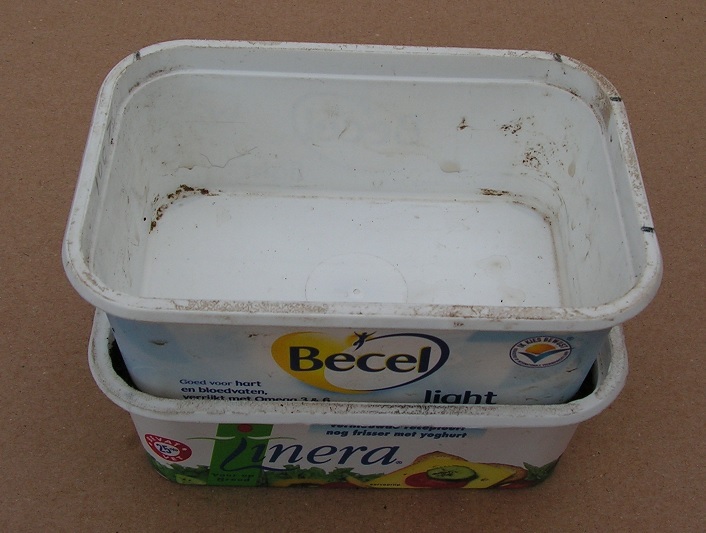 Put the margarine box with lid on (or the “greenhouse of margarine boxes”) indoors at about 18 to 20 C (64 to 68 F). Tomato seed germinates well at that temperature. About 7 to 10 days after sowing, first tomato plants are visible. Are there some plants visible? See at A6). When needed spray some water on the soil. Then put on the lid or the “upside down box” again. Before sowing, you can lay a piece of sink mat on the potting soil. Then you can sow at equal distances. More info about this mat in tip 29 . Drop 1 tomato seed in each mat hole. Right after sowing, remove the mat. You can pick tomato seeds between thumb and index and drop into the mat holes. But sowing is also very easy when using a shove drop tray. This tray is described in tip 33) . You can use a “normal (non cut) 500 grams margarine box. 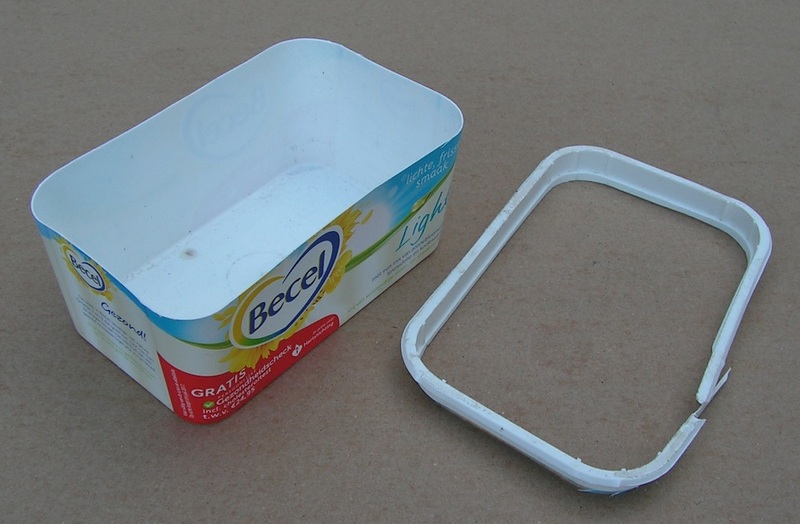 Lay the original lid loose on the margarine box (or click at 1 side). A normal margarine box of 500 grams is longer and wider than a 250 grams margarine box. It can happen that a transparent box that fits well over a 250 grams box, does not fit over a normal 500 grams margarine box. It is useful to cut the upper part (the wide edge) of a 500 grams margarine box. Reason: see further in this tip. Fill the box with potting soil. Spray water on, lay seeds on, cover with potting soil (on the middle photo above there are sweet pepper seeds on the potting soil, but this procedure works at tomato seeds as well). The original lid fits well on the margaine box with cut upper part (wide edge), as shown on this “upside down photo”. 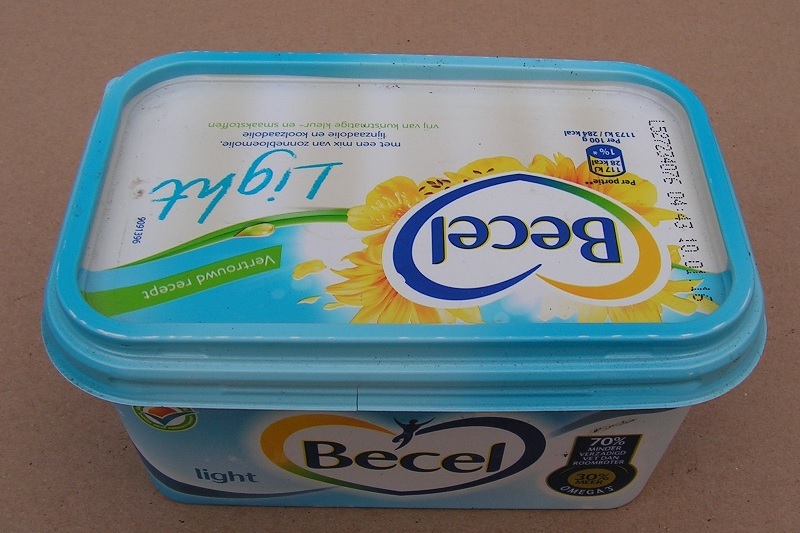 The lid is not stuck, but it lays loose on the upper edge of the cut margarine box. Lay the original (well fitting) lid loose on the box. When you don’t have a fitting lid? You can put on a “too big” or “too small” lid. That works well too. 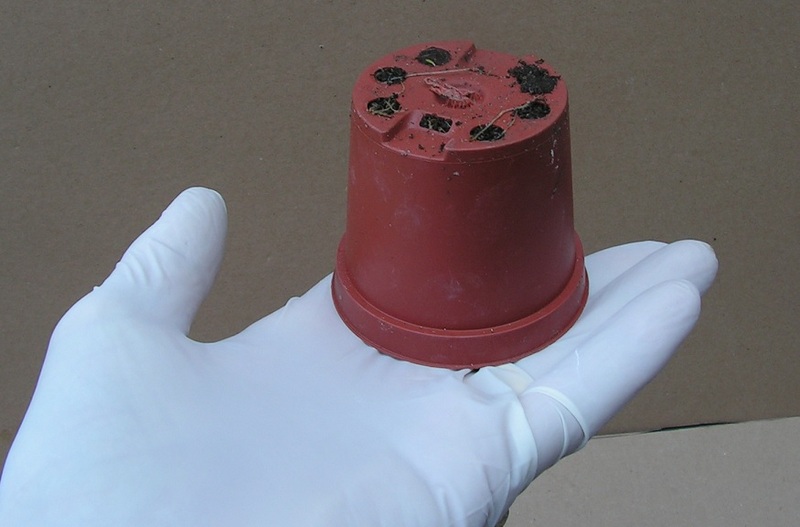 The lid and the box form narrow air openings and the potting soil does not dry out fast. At a small lid, you better cut off the little tab first. So it better fits on (in) a big margarine box. See the right side box on the photo above. 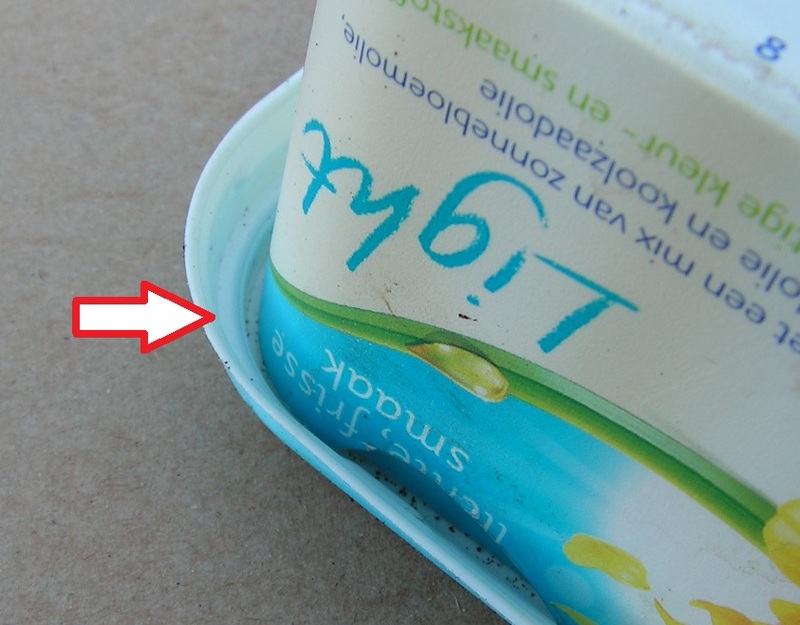 When first plants are visible, remove the lid or the top margarine box. When you wait too long, plants will grow thin and long. Place the box with plants indoors, near a window. Temp between 15 and 20 C (59 to 68 F). You can put the little tomato plants on a sill before a window, under such a mini green house. This transparent top is a plastic box meant for selling mushrooms. You can use a similar transparent plastic box. Try to have some room (about 1 centimeter, 0.5 inch) between transparent box and window sill to have enough air circulation. The plastic mushroom box fits well over a cut 500 grams margarine box. You can put a sink mat with 24 mat holes in it, so 24 sowing spots. The original lid fits well over the cut edge, with small air openings. A transparent box can be put over th emargarine box. When the plants are about 2.5 cm (1 inch) remove the transparent box. Let the plants grow bigger at a light, cool place (before a window at about 15 to 18 C (59 to 64 F). You will get firm plants. When the plants grow up too warm and too dark, you get thin, spiky plants. When this happens, put them at a lighter and colder place. 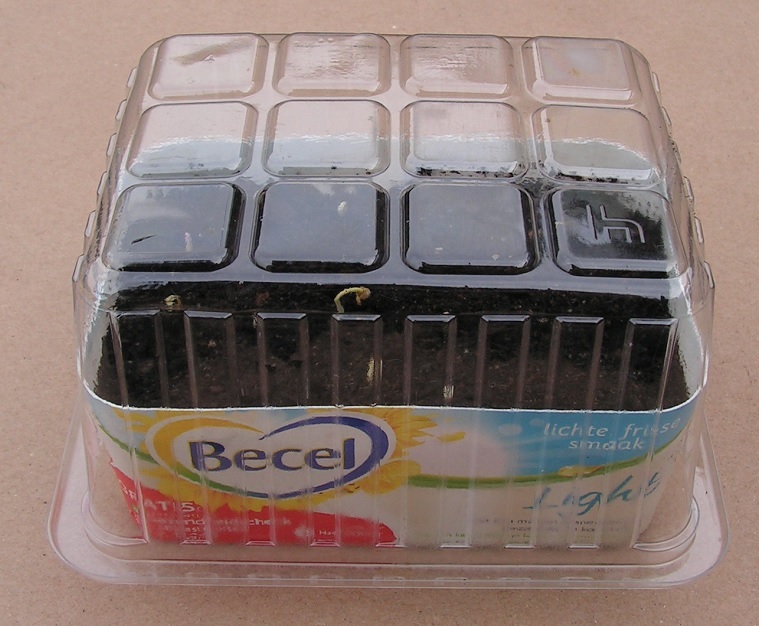 Let the tomato plants grow in the margarine box until they have 4 or more leaves. Then they are big enough for transplanting. As shown on the photo above. The plants have branched roots, and much sowing soil will hang to the roots. After replanting, these plants grow on better. 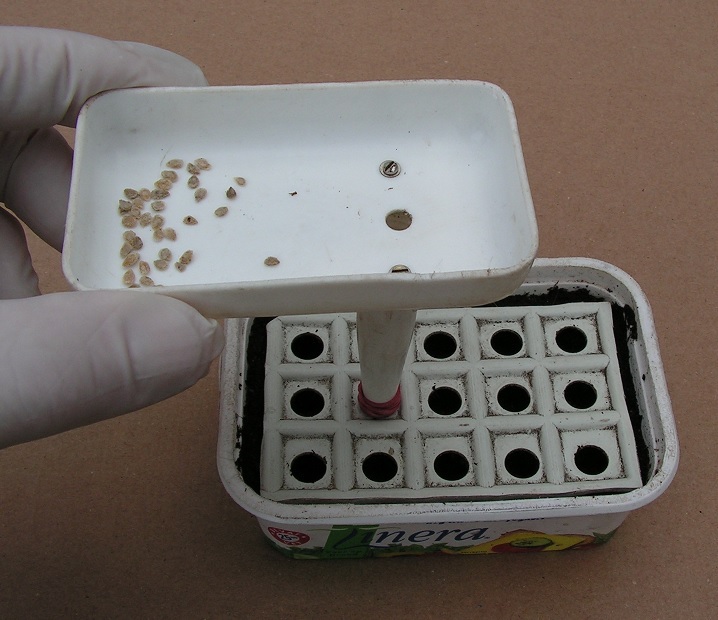 Tomato seeds germinate well without covering soil. This is very illustrative and educational for everyone, espicially for school children. More photos and info about this topic in chapter A7) of tip 8) of my Dutch blog . When plants have 4 (or more) leaves, you can transplant them. Fill small flower pots with a thin layer of potting soil or compost. Put each plant with a small root ball in a pot. Plant depth: 2 lower leaves (seed leaves) just above soil. Then fill the flower pot with compost or potting soil until full. In this way plants will make more roots and will not fall over that easy. Note: later on, the lower leaves of the tomato plant will still grow up a few centimeters (1 inch or so). Place the pots with tomato plants on a light, cool place, 15 to 20 C (59 to 68 F). Tomatoes grow much faster than (sweet) peppers. When tomato plants grow thin and long than the place is too warm and/or too dark. Put them at a colder place with more light. When tomato plants are about 15 to 25 cm (6 to 10 inch) high, the flower pots will be too small. Put the flower pot with tomato plant at an accessable place (where you can easily pick it up and take it in your hand). Turn the whole, until the plant points down and the bottom of the flower pot is up. The root ball is visible through the bottom holes in the flower pot. Use a spoon (or a garden shovel or a wooden lath or something like that) to tap the bottom of the flowerpot. Tapping makes the root ball loose from the pot, so the root ball drops a few millimeters (about 1/8 to 1/4 inch) downward. Now the root ball is not visible anymore through the bottom holes in the flower pot. Put the root ball of the tomato plant in the planting hole. Replants the plants far apart, so not to close. The tomato plants can grow big and form large root balls. On the photo above, tomato plants have been taken out of flower pots and put in a layer of compost in a shopping crate. Tomato plants have grown bigger already. You can plant them in a laundry basket with a layer of compost. Or in a low tray with holes in the bottom, with a layer of compost in it. Put the shopping crate, tray or laundry basket with plants at a warm, light place. Or put it at a warm spot in your garden by day. And indoors during the night. Or put the tray or crate or basket with plants in a greenhouse by day, when you have one. On this photo you see tomato plants in my “deep greenhouse”. Put the tray or crate indoors during the night or at cold weather. Water the plants and the compost sufficient. Excess water flows out of the tray (crate, basket) via the holes in the bottom. Do not put the plants in the full sunshine for a long time. Put the crate (tray, basket) with plants (temporary) in the shadow. Or put a white sheet over the greenhouse. By putting the plants outdoors and indoors, the plants can get used to the outdoor temperatures. When you have a greenhouse made of transparent corrugated plate, you can put tomato plants under it (in a window box liner). Take the tomato plants out of the flower pots. Put the plants (with a big root balls) in a window box liner filled with compost. The box liner has holes in the bottom. The replanting can be done at early April (early spring) when the plants are big enough. In a box liner of 80 cm (2 ft 8 inch) you can put 8 plants. Each plant has enough space then. Dig a furrow in the garden soil and put the window box liner with tomato plants in the furrow. The top of the liner is at the same level as the garden soil. Push some moist garden earth against the sides of the box liner. 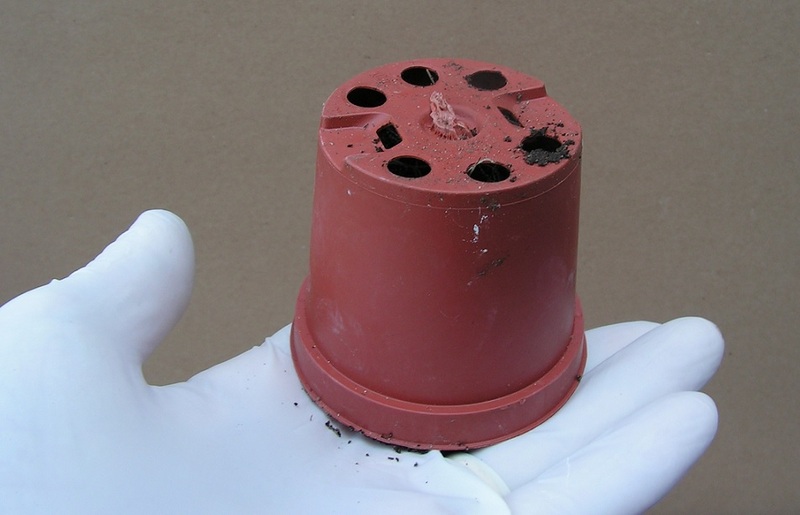 The plants in the liner can grow until a heighth of 15 to 20 cm (6 to 8 inch) before touching the top of the tunnel. Put the tunnel of transparent corrugated plate over the plants. Close each side of the tunnel with a plate (for example made of plexiglass). To prevent draughts in the tunnel. So no risk of aphids. Info about this tunnel in tip 13.
on the top photo (2016) there is a box liner with 8 bell pepper plants, a box liner with 16 tomato plants and flower pots with bean plants under the greenhouse tunnel. on the bottom photo (2017) there are 2 box liners next to each other, each one with 7 tomato plants under the tunnel. At warm, sunny days put a white sheet at the sunny side of the tunnel. You can use bamboo sticks and clothes pins. Without a sheet, temperature in the tunnel can get too high. Three weeks later, the tomato plants are bigger. They almost reach the top of the tunnel. Remove the box liner. Dig the hole some deeper. Put the liner with tomato plants in the deeper hole in the soil. You can put a little moist garden earth against the sides. Put the tunnel over it. 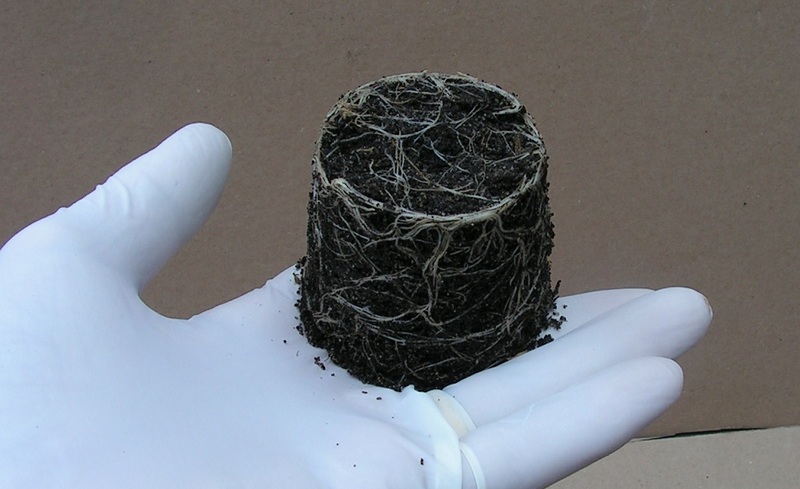 About May 1 (mid spring), the plants in the liner are about 30 cm (12 inch) high. The plants almost touch the tunnel. Take the box liner with tomato plants out of the hole in the soil. From this day on, the liner with tomato plants is in the open air by day. During cold nights or days the liner is indoors or under a roof. The tomato plants in the deep greenhouse have grown bigger than the 16 plants in the box liner under the tunnel of corrugated plate. So growing in the deep greenhouse is some better. But growing in a window box liner under a tunnel goes well too. Put 8 plants in a window box liner of 80 cm (2 ft 8 inch). You can sow tomatoes very early (mid or end of February, late winter). Then the plants can be put in a greenhouse in early April (early spring). You can sow (more) tomatoes in March (early spring). These tomato plants can be put in the greenhouse much later. Photos of my self grown tomato plants on May 8 (mid spring). In the green tray there are early sown tomato plants, in the black tray later sown plants. There is a clear difference between the 2 groups of tomato plants, see photos above. The early plants have thin, yellow stems and small brown spots on the leaves. And there are flowers on the plants. The late plants have thick green stems, green leaves and no flowers yet. All plants have approximately the same height. Probably the thin yellow stems are due to the cold weather when the plants were in the greenhouse. They have been there during many cold (frost-proof) nights and days. The green tomato plants have been put in the greenhouse much later. When sowing tomatoes too early, it can happen that the plants grow slowly and the leaves and stems get yellow. Due to low temperatures in a cold greenhouse. Sowing tomatoes at a later date is better. My experience: yellow leaves and stems turn into green ones within a few weeks after planting in the garden soil. Tomato plants do not grow upright by them selves; they “crawl” over the soil. Most times a tomato plant is led upward. Put a (bamboo) stick in the garden soil next to the plant. Fasten the stem of the plant to this stick using (plastic) strips or a piece of rope. Or let the plant grow along a vertical hanging rope. Mak a deep hole in the garden soil and put some compost in. Put the tomato plant in the hole and fill the hole with compost and garden earth. Or make a less deep, shallow trench in the soil. Put some compost in the trench. Lay a tomato plant in the trench. Carefully bend the stem upward and put compost and garden earth on the stem and on the roots. The upper part of the stem is above the soil level. More info at this site . Remove the top of the plant above the 3rd or 4th group of flowers (flower cluster). Then all sun energy is used for growing and ripening tomatoes in the 3 or 4 bunches (groups). Water the plants sufficiently. Water on the soil around the plants. Don’t pour or spray water on the leaves. Break off or cut off leaves during plant growth. Start removing leaves at the lower side of the plant. When the tomatoes are big, the plant does not need many leaves anymore. Also remove leaves with brown spots. Or cut off the parts of the leaves with brown spots. Tomatoes that grow in a (big) allotment garden, can get the plant disease “Phytophtora”. On the leaves, the stem and the fruits of the tomato plant, dark brown spots appear. The tomatoes start rotting. Much info about this plant disease on the internet. By cutting off the leaves with brown spots you can delay or retard (or prevent) the attack by Phytophthora. In tip 7) Roof over sweet peppers or tomatoes there is info about putting tomato plants in the garden soil. And info about supporting and watering the plants. Pick all tomatoes from the plants at the end of September (end of summer) and take all plants out of the soil. Let the green, yellow and orange tomatoes ripen. Info about ripening in tip 15. In a big allotment garden, tomato plants can suffer from the plant disease Phytophtora (Tomato Blight). Suffering from this disease, there are brown spots on the leaves, the stem of the plant gets dark brown, and the tomatoes get dark spots and start rotting. Tomato plants get Phytophthora when the leaves are wet very often and for several hours. So when water drops lay on or hang at the leaves. This can be pouring water, rainwater or condensed water. You can put tomato plants under a roof to keep the plants dry. This can reduce the attack by Phytophthora. When tomato plants (growing in an alloment garden) are not wet by rain, there is less risk of attack by Phytophthora. In my allotment garden, tomato plants are under this roof. Before raining, one can fix plastic foil at all 4 sides of the roof. The side foil stops slanting torrential rain (///). At dry weather the side foil is folded down. See photos above of 2017. Right under the roof there is plastic foil. Dew drops falling from the lower side of the roof fall on this foil and not on the tomato plants. In a closed (backyard) garden, there is less risk of Phytophthora. A roof over the tomato plants is sufficient. Sides of the roof may be kept open. All photos and descriptions below concern growing tomatoes in my backyard garden. Tomato plants under a curved or a flat roof in my backyard garden. Sides are open. At slanting rain, the lower leaves and lower tomatoes get wet. And mud splashes on the lower fruits. My experience: in a closed garden both events do not give brown spots or rotting tomatoes. You can put a layer of straw on the garden soil to reduce the mud splashing. Under a curved or flat roof, drops of condensed water fall from the lower side of the roof on the (top) leaves. These water drops cause brown spots on some leaves. Cut off the leaves with brown spots. Or remove (cut off) the parts of the leaves with brown spots. This stops or retards the attack by Phytophthora. The stems and tomatoes do not get brown spots then. Info about tomato plants and roofs in 7) Roof over sweet peppers or tomatoes . In a closed (backyard) garden you can grow tomatoes in the open air, so without a roof over them. “Moneymaker” is a good species for this growing. Some leaves get brown spots due to rainwater or condensed water. Cut off these leaves. Or remove (cut) these brown spotted parts from the leaves. Break off or cut off the top of the stem after 2, 3 or 4 groups of flowers. To have all tomatoes grow big. And to have many ripe tomatoes. During growth, remove many leaves from the stem. Start removing leaves from below. Reason: the less leaves at the tomato plant, the less leaves can get wet. So less risk of brown spots on the leaves (Phytophthora). A tomato plant with many big tomatoes needs only a few leaves to grow, to ripen and to stay alive. At the end of September (begin of fall) there are many big fruits and no leaves at the tomato plants. Due to much rain falling on, a few tomatoes can get cracks. Mostly the top fruits. Below there is info about good tomato growth in the open air. Thanks to good weather and many leaves removed. On this photo my tomato plants in the backyard garden, on September 29. Many tomatoes harvested yet and all leaves removed. At a good, warm and dry summer and when you treat the tomato plants well, you can harvest many tomatoes in the open air. Treating well means pinching or cutting out the top above 3 (or 4) groups of flowers , watering the plants on the soil around the plants and removing many leaves. Below info about bad tomato growth in the open air in my garden. This is due to cold weather and too few leaves removed during growth. Date October 1. Tomato plants with many grey leaves. Tomatoes look good. ….. and laid in a washing-up bowl on moist kitchen paper, under plastic foil. The twigs are put in a small beaker with water. Three days later the tomatoes are rot and mouldy. Conclusion: In a closed (backyard) garden you can grow tomatoes in the free air. Harvest all tomatoes, even unripe ones, before late summer (end of September). Break off (or cut off) many leaves during the tomato growth. You may end up with zero leaves in late summer. When you cut the stem of a tomato plant, you can see white material or a brown ring. Maybe a stem with all white is from a healty plant. And perhaps a brown ring means Phytophtora. Nothing found on the internet about this topic yet.